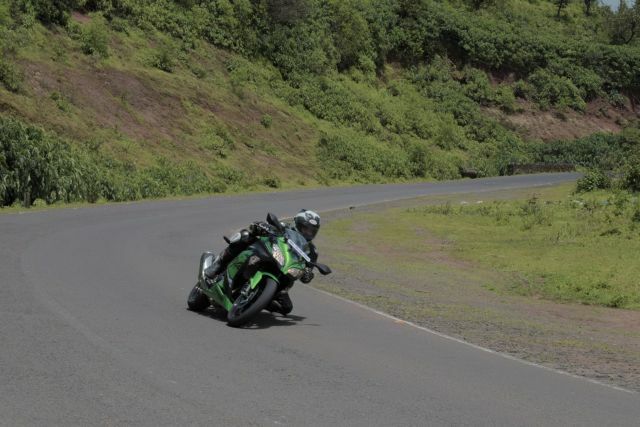 Sure, riding at speed on open highways with the throttle pinned is fun, but a loop of my favourite twisty road reminded me of why the baby Ninja is so well loved. The steel diamond-type frame may be dated, but remains extremely flex-free, even at extreme lean angles, and the bike stays composed and planted when hustling through a tight series of curves. The MRF tyres this bike now comes with worked admirably well, but did seem to be struggling for grip at aggressive corner entries and when exiting, leaned over with the throttle open — I would definitely consider upgrading to stickier, imported tyres if I were planning on taking this bike to the racetrack to fully exploit the potential of the chassis and suspension, although the MRFs should be enough for the majority of road riders. Although the Ninja 300 is a serious corner-carving tool, the somewhat high-set handlebars mean that it is easy to find a comfortable riding position for city or highway rides, without having to reach far forward to the controls. This extremely fun motorcycle has just gotten so much more accessible with the recent price cut, and brings to the table an extremely entertaining engine package, with that revvy engine within a sturdy frame, wrapped in a very attractive fairing. It ticks all the right boxes for a small, beginner-friendly sportbike that even more experienced riders can enjoy, and does everything from city commuting, highway rides and canyon blasts admirably well. She may be a little long in the tooth, but the Ninja 300 is still an awesome little sportbike.